PAWS' Tiger Trio Turns 15: Happy Birthday Roy, Kim and Claire! The small cubs were the product of a roadside zoo’s breeding venture that sold innocent babies into lives of misery as exhibits. It feels like it was just yesterday when tiger siblings Roy (pictured left, being examined by Dr. Jackie Gai, DVM), Kim and Claire – only four months old at the time – arrived at PAWS in June 2003. The small cubs were the product of a roadside zoo’s breeding venture that sold innocent babies into lives of misery as exhibits at disreputable zoos, exotic pets, or photo props in pay-to-play operations. Roy is relaxed and easy going. He enjoys napping in the soft, green grass, with his sisters close by. 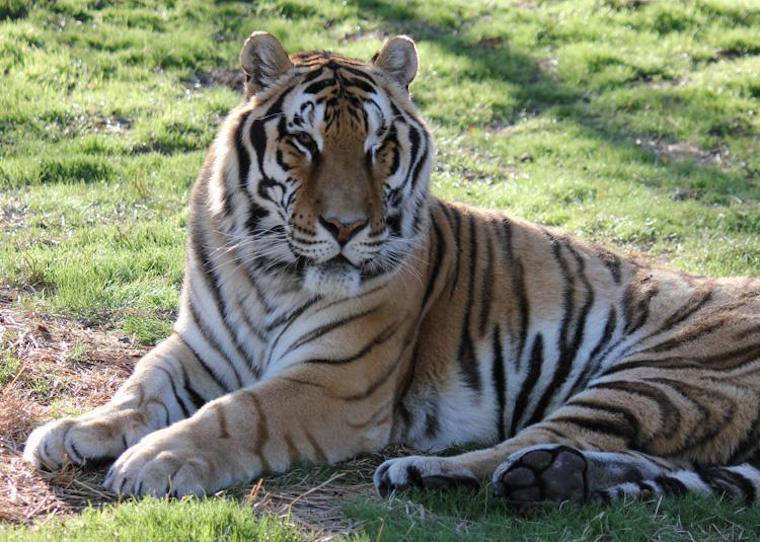 Weighing more than 500 pounds, and standing over four feet tall at his shoulder, Roy is the largest tiger PAWS has ever rescued. Kim may be the smallest of the siblings, but she is the most outgoing and eagerly explores their habitat. Claire is the cautious one. 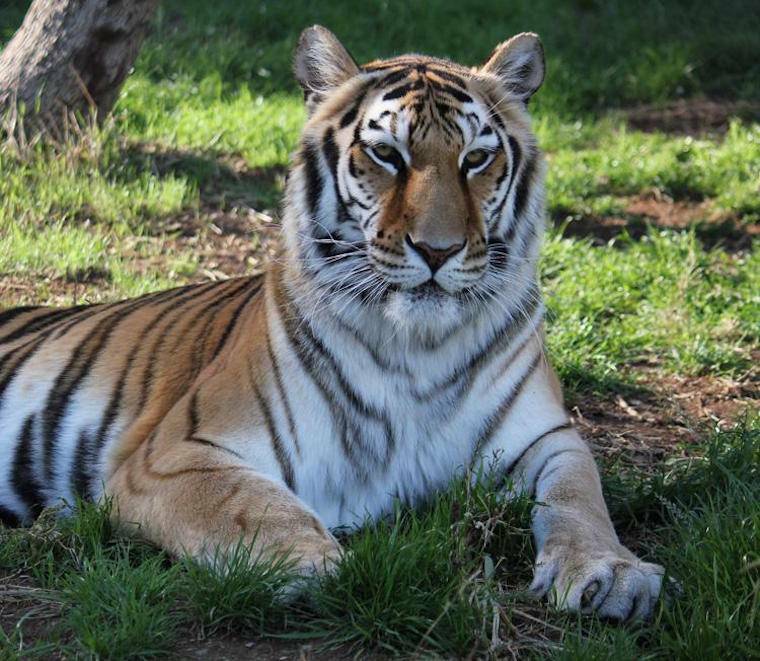 ﻿She stays close to Roy, and the two tigers can often be seen lounging in the grass together. Won’t you commemorate this special birthday by making a $15 donation today – one for each year of Roy, Kim and Claire’s lives — or $45 for all three? 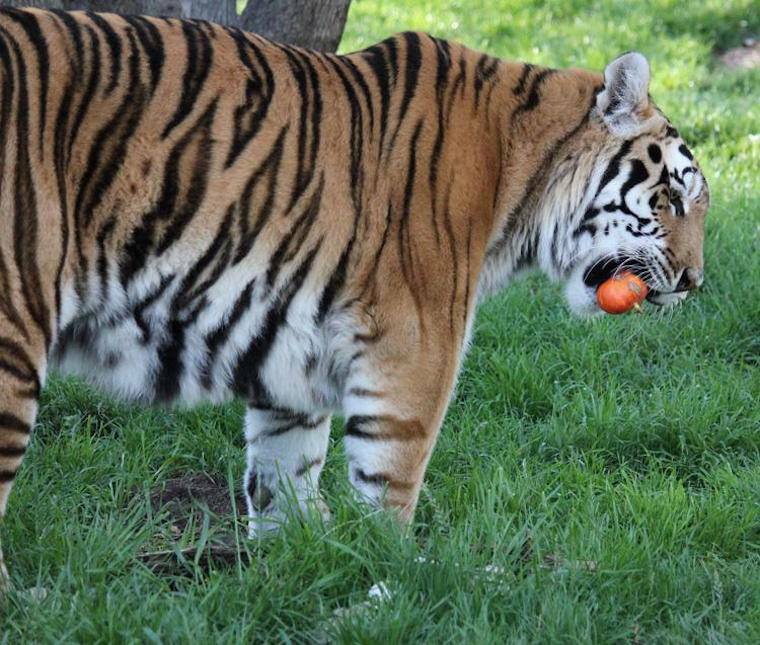 It costs $30,000 a month to feed and furnish round-the-clock care for our 17 tigers and other big cats. Your donation ensures that Roy, Kim and Claire continue to thrive in a safe haven, immersed in nature, where they can engage in natural behaviors.